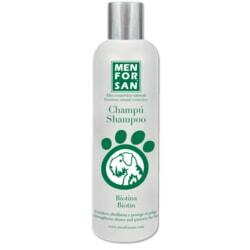 Natural shampoo Menforsan with biotin for maximum grooming your dog! Troubled your four-legged friend's hair dry or seborrheic dermatitis? Then this shampoo Menforsan idální choice! Natural ingredients with vitamins provides the best results and regular use of the shampoo you guarantee prevention! What is biotin? Biotin (known as vitamin B7) is beneficial to people and dogs, and solves problems with brittle nails and hair loss in humans, dogs can in turn strengthen thin and fragile hair and significantly improves the quality of keratin structures. At the same shampoo regenerates and strengthens hair roots, thus preventing hair loss.